The stage for the Democratic National Convention, inside Time Warner Cable Arena in Charlotte, North Carolina, as it neared completion. Photo taken September 1, 2012, by Gary C. Caskey/UPI). UW Election Eye is sending two reporters to the Democratic National Convention as we kick off our stretch run of analysis of the 2012 electoral campaign. In weeks to come we will dive into other key campaigns and political mosh pits. CHARLOTTE, North Carolina — We steward our resources with great care on this blog. After being a bit less active in our posting this summer, we are set to take off again beginning …. now. Thanks to supporters, we have enough funds to travel a couple times over the final 10 weeks of the 2012 election season. Our first trip comes this week: two of us, Amber Cortes and me, will report on the Democratic National Convention. Later in September our colleagues will travel to conservatives’ Values Voters Summit, and in October we will make at least one swing through some presidential battleground states. Always we will keep an eye on Washington state politics as well. Right now, our eyes are on the DNC in Charlotte. This town of just over 750,000 — more than 20% larger than Seattle — is nicknamed The Queen City in honor of Queen Charlotte, the wife of King George III, who named the city. The Democrats come here after the Republicans held their convention last week in Tampa. Our goal this week is to capture the DNC experience in the style of UW Election Eye: to look beyond the speeches, gaffes and partisan jabs of political insiders and to focus on the personal stories that make politics come alive. The convention will be brimming with the stories of 35,000 visitors, about half of whom, remarkably, will be press. The DNC runs Tuesday through Thursday; we will be posting pieces regularly all week and into the weekend. We will see how celebrity guests such as the Foo Fighters take on a political edge. We are interested in the increase of more than 50% of gay Democratic delegates over the 2008 convention. 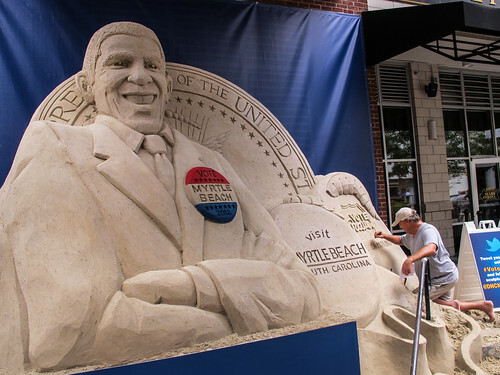 Sand sculpture of President Barack Obama outside the Democratic National Convention hall in Charlotte, North Carolina. The sculpture invites visitors to travel south to Myrtle Beach, South Carolina. Photo taken September 1, 2012, by flickr member kenfagerdotcom. And even though we are jaded Seattleites used to 24/7 wi-fi, we are in awe of the amount of technology needed to host such a huge event: the planning committee installed 20 miles of cables in Time Warner Cable Arena to power the digital and electrical needs of the convention. In fact, check out this nifty time lapse of the construction. And we’re thankful that phone companies have installed additional antenna systems and cell towers in anticipation of “record-setting traffic” by tech-savvy delegates and cell-wielding, citizen journalists. Like us. We will talk to some Washington delegates. We will look into the party’s platform, which is the collection of the issues and positions that Democrats commit to supporting. And we will try some barbecue, on behalf of all our readers. And always, we will try to bring the convention in a personal way to you. For updates, memorable photos and insights of each day, follow our Twitter feed, @uwelectioneye, and our reporters’ own handles–@IlonaVik and @uneverknowradio—and hashtags #electioneye, #DNC2012 and #CLT. We welcome suggestions in the comments section of DNC stories you’d like to see us explore.